Have you ever left your home in the morning, looked back to say goodbye to your cat, and wondered what she did all day when you were gone? The answer is probably less interesting than you hoped: cats sleep for two-thirds of the day, so she’s most likely snoozing for the majority of your absence. But what about the other third of the time? And what is she doing while you sleep? 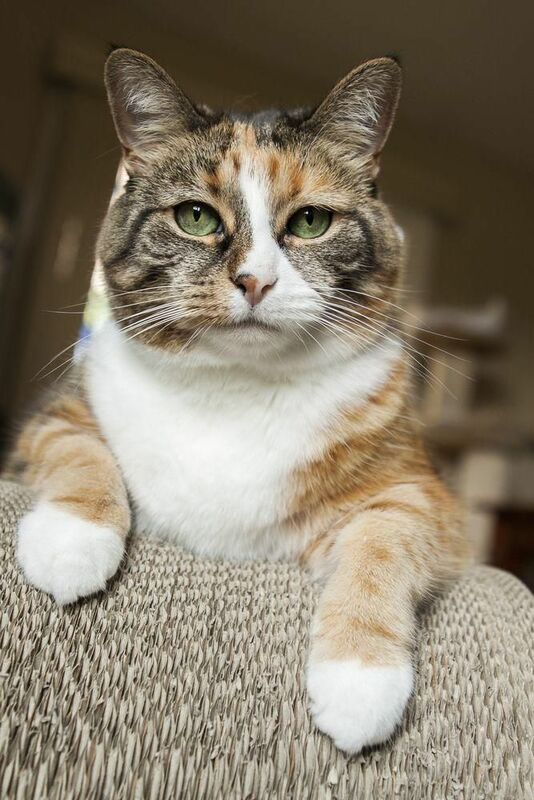 If your kitty is like most felines, she may be getting bored. This is especially true if your cat is indoors only, and even more so if he or she is an only cat. Cats are natural hunters, and though they spend the majority of their time asleep, they need to spend their waking hours pursuing normal, cat-like behaviors, including chasing, stalking, and catching. Most homes today don’t provide the necessary stimulation for our feline friends. This leads to boredom. And a bored cat is often a depressed and destructive one. Luckily, there are easy ways to relieve your cat’s boredom and keep her in fighting shape, even when she’s alone. – Destroying your furniture? Cats need something to play with, something to exercise on, and something to scratch. If you don’t provide these things, your cat will make his own toys and scratching posts out of your couches, chairs, and any fragile items you’ve placed on a high, non-cat-proof shelf. 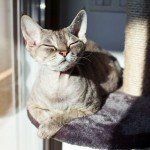 – Skipping the litter box? This can be caused by lots of problems, and a cat who’s not using the litter box should start by visiting the vet to rule out medical problems. But, if health isn’t the issue, and the litter boxes are clean, it’s time to start thinking psychologically. Cats can’t communicate with us easily. Sometimes the only way to get humans to hear “I’m frustrated!” may be to relieve yourself on their shoes. – Over-grooming? When things get really bad, cats take the pressure out on themselves. Similar to humans who cope with stress by engaging in self-destructive behavior, over-grooming usually originates from severe anxiety and unhappiness. This may warrant a trip to the vet, but often relieving the boredom will relieve the stress and stop the behavior. – Sudden whirlwind bursts of running around the house? This is one of the more harmless signs that your cat is bored. All cats need a certain level of activity to be satisfied and healthy. If you don’t provide that activity level with appropriate play time, your cat is left a ball of energy. And what do balls of energy do? They bounce around! While running back and forth isn’t dangerous, it’s an early indicator that your cat needs more stimulation and play. How Can You Relieve Your Cat’s Boredom? The easy answer to this is to let your cat spend some time outside, where she can exercise her natural instincts. However, this is often impossible, especially for urban cats where the outside world can be too dangerous. 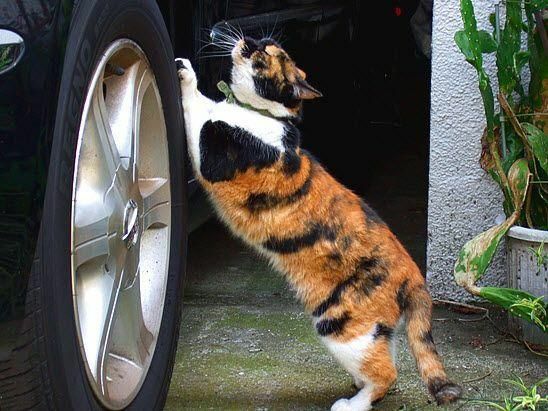 Outdoor cats are more likely to be killed by cars, and sometimes they do damage to neighbors gardens or wild birds, although a bell collar can help with the latter. 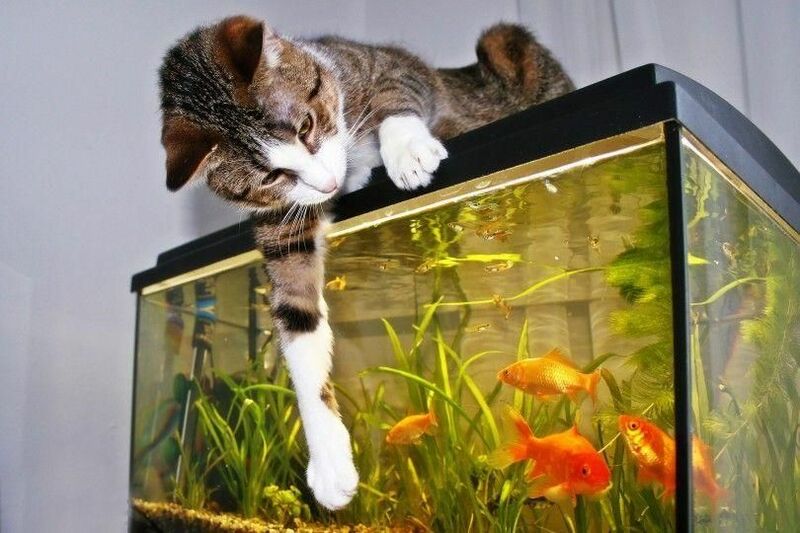 Luckily, there are ways to relieve your cat’s boredom without putting him in any danger. These don’t have to be expensive, specially made “cat trees.” Cats aren’t picky! A high bookshelf with a cat bed on top, a tall stool, or even a series of smaller shelves arranged on the wall will work. The important thing is to keep surfaces that you want your cat to use clear of decorations or anything breakable. You can introduce your cat to these structures by sprinkling catnip on them: he’ll get the message. You can also build a fancier cat structure with scrap wood and carpet samples if you’re feeling ambitious. The important thing is to create a structure your cat can climb, leap from, and run to. Many cat toys, like the beloved fishing poles and yarn, need a person to operate them. Other cat toys rely on catnip to get your kitty’s attention, which wears thin after about 10 minutes. However, there are cat toys that your can buy or make that will actually entertain your cat while you’re away. Some of these are battery operated, offering a moving target that your cat can chase. But there are also ingenious, inexpensive cat toys that you can make for yourself. A simple empty roll of toilet paper can turn into a rolling ball, a hidden treat holder, or a puzzle only your kitty can solve. The goal is to keep your cat’s body and mind working. If you’re lucky enough to have access to the outdoors, consider building a simplified “catio,” a patio designed for cats. There are easy-to-follow tutorials online if you’d like to build it yourself, and the materials usually aren’t too expensive. A catio allows your cat to spend time outdoors without risk to himself or others. If that’s not an option, try to bring a little bit of nature indoors. Offer a flower box filled with cat grass for your cat to snack on. Provide a variety of textures on the floor and on climbing surfaces, such as astroturf, straw mats, or corkboard. Offer running water in a special cat bowl to simulate a natural water source. You can even play a CD of nature sounds to complete the effect. Your cat may not be able to live in the jungle, but you can recreate the ambiance of nature at home. You may have heard the advice that the easiest way to cure your cat’s boredom is to bring home another cat. It’s true that, when two cats get along, they are happier and healthier than being alone. Additional cats provide companionship and play for your friend while you’re away. That said, there is no guarantee that your new cat and your old cat will get along. If they don’t, you may go from a cat that’s bored to a cat that’s hostile, aggressive, and miserable. How can you tell if your cat wants a friend? Talk to your local shelter about your concerns. Often the volunteers at cat shelters know their resident’s personalities very well. They can recommend a suitable companion for your kitty and hopefully avoid clashing personalities. You may even be able to bring your cat to the shelter, so he can meet new acquaintances in a neutral setting. Getting an additional cat can be a perfect solution to your cat’s boredom, but only if done correctly. Finally, the most important thing you can do for your cat is simply to care. Play with him when you are home, and give him lots of attention and affection. Make your home a welcoming, fun, and safe place for her while you’re away. Your cat will reward your efforts with a lifetime of purrs, snuggles, and headbutts. After all, life with cats is never really boring.